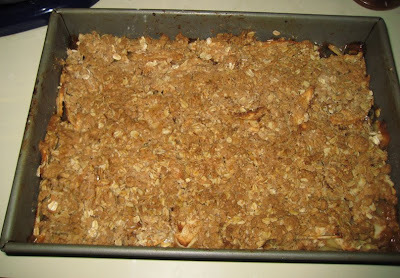 My mom used to make the best apple crisp - sweet and buttery, with a crunchy topping and tender apples. It's probably one of the reasons I love autumn so much today. Alas, I have no idea where she got her recipe, although it may have come from a 60s edition of the Better Homes and Gardens Cookbook. I have her original copy, but it is very dog-eared and stained, and some of the pages are missing...including any that might have had the recipe for apple crisp. After the freakish cold snap we had last week, I decided it was time to bake one of my own. Well, not of my own - I borrowed a recipe from Top Chef. This season, Robin Leventhal won a Quickfire with her version of this autumn favorite so I thought I'd give it a try. It was quite good, but it wasn't my mom's. (Hey, Robin - you're not my mom!) I like my crisp sweet, and this recipe called for a relatively small amount of sugar. 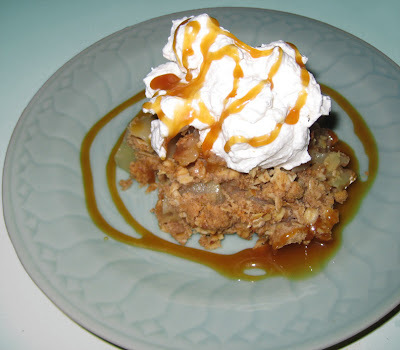 The Gala apples I used, plus the grated orange zest added too much tang for my tastes. Next time I'll use Red Delicious, which is what my mom would have used. I originally was going to skip making the amaretto caramel, but since I was avoiding the Ravens game, I decided I had plenty of time. It came together really easily, and added some of the missing sweetness. The best part of this recipe, however, was the cardamom-flavored whipped cream. Wow - it would be fab on a cup of hot cocoa!